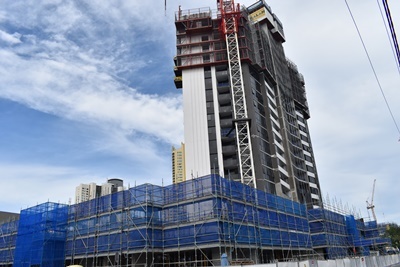 High winds and wet weather over the past couple of months have created slight delays in the construction of the shiny new Ruby Collection development in Surfers Paradise. As a result, opening of the first tower in the billion-dollar development – the Ruby Apartments – will be delayed by two months, with the doors now scheduled to open early November. Being highly focused on the guest holiday experience at sister property, Paradise Resort, CEO David Brook remains unconcerned with the two-month delay. “Although we would have liked to have been open this September, the revised November launch date makes allowances for any further weather delays,” he said. Mr Brook went on to say that the move enables his team to continue to schedule works on the northern side of the building and around waterpark operating times so that Paradise Resort guests are not inconvenienced. Despite the delays, builders are already working on the 21st floor of the 30-floor tower and have laid the foundations for the 13-ground floor villas situated along Oak and Norfolk Avenues’ which all form part of Stage 1 of the development. Fit-out of the first 6 floors will commence late March and the Ruby Collection team can’t wait to start installation of all the fittings, fixtures and decorative touches that will make the Ruby Apartments shine in the accommodation market. 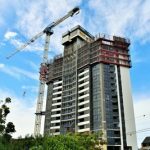 While both Paradise Resort and the Ruby Apartments are owned by the same parent company -The Ralan Group – when Tower 1 of The Ruby Collection opens in November, they will operate independently. “We’ve made no secret about the fact that Paradise Resort will eventually be retired to make way for The Ruby Collection towers 2 – 4, but it will be business as usual at Paradise Resort for another 18 months at least,” said Mr Brook. Advance bookings for The Ruby Apartments will commence towards the end of this month with a range of special pre-opening packages on offer, with exciting value and something for everyone.